Think motorized window coverings are out of your reach? 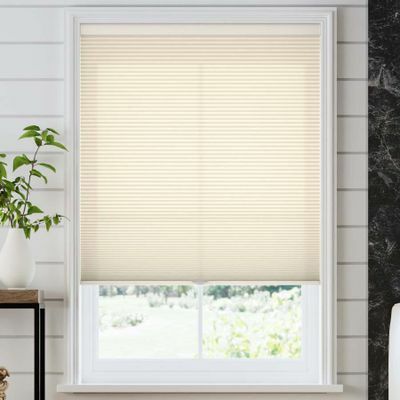 Enjoy the convenience of these custom electric shades without blowing your budget. 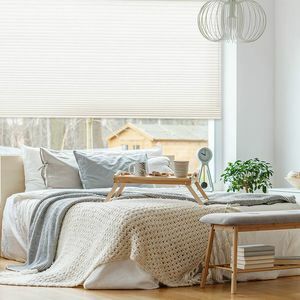 Raise and lower them with the touch of a button on the ergonomically designed handle to fill your rooms with gently diffused color and warmth through soft, pleated fabric in contemporary neutral colors. You’ll enjoy hours of effortless operation with the sleek looking, rechargeable ElectraLift wand that plugs easily into a standard USB port on the light-weight aluminum headrail. The head and bottom rails are color coordinated with the easy-care, soft-spun polyester fabric for a smooth, seamless look. You’ll save money, too, with these energy efficient, Select Light Filtering Motorized ElectraLift Wand cellulars. The single-cell construction traps cold and hot air (and helps reduce noise!) to keep energy bills down. And with the included USB charger, you never have to spend money on batteries to keep them working. 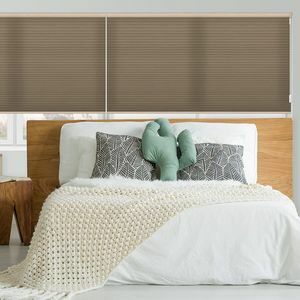 Best of all, these cordless honeycomb-style window treatments come with the peace of mind that they’re certified Best for Kids. So get moving! Order some fabric samples to find just the right color you’re looking for. Fabric and headrail made 3/8" smaller than width ordered on an inside mount. Headrail, bottom rail and end caps are color coordinated to color selection. To ensure optimal shade durability, headrail is made out of lightweight aluminum and bottom rail is made from steel-weighted aluminum. Rechargeable Motorized ElectraLift Wand includes rechargeable motor battery, 10' USB cable charger and charging brick. Battery charge will last 3-6 months. Battery can be recharged up to 500 times. It takes approximately 7 hours to recharge the motor when fully depleted. ElectraLift Wand control Micro USB cable plugs into the top of the headrail for easy operation. The backside of wand has a Micro USB charge port for easy access to charge your shade. The shade is functional while in charging mode. This shade was a perfect buy for the value and easy to install! I will be purchasing more. Impressed with how well they work . can"t beat the price. It looks great , better then I expected. Very impressive shades! The design and value exceeded my expectations. Installation had the same level of difficulty as a non-motorized shade. 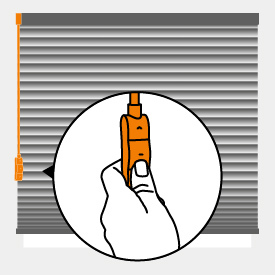 The color-matching headrail is compact and the white-colored control wand is relatively unobtrusive as compared to corded shades. The electric lift obsoletes corded models. For an 80" high shade, it takes 52 seconds for the motor to move the shade from fully-open to fully-closed. The motor makes some noise. A cordless shade moves much faster and with less noise. It would be great if the same lift was available for double-cell, blackout and larger pleat sizes.